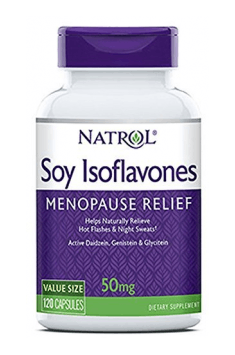 Soy Isoflavones 50mg 120 caps. Soybean phytoestrogens are water insoluble compounds, so for the best bioavailability, the supplement should be taken with a fat-containing meal. Other species of plants from the fabaceae family also contain phyto-oestrogens. That is why in the menopausal period it is worth to supplement the diet with ingredients such as chickpeas, alfalfa sprouts and mung beans.